Here&apos;s a bonus 16th! Longfellow Elementary School, 1895. Published Feb. 1, 2018 at 9:03 a.m. It's creepy, I know. I've become that guy that asks everyone if I can peek into their attic. That's because ever since I first saw the graffiti covered attic at Maryland Avenue School, I've been on the lookout for penned, penciled, etched, painted traces of people who visited before me. 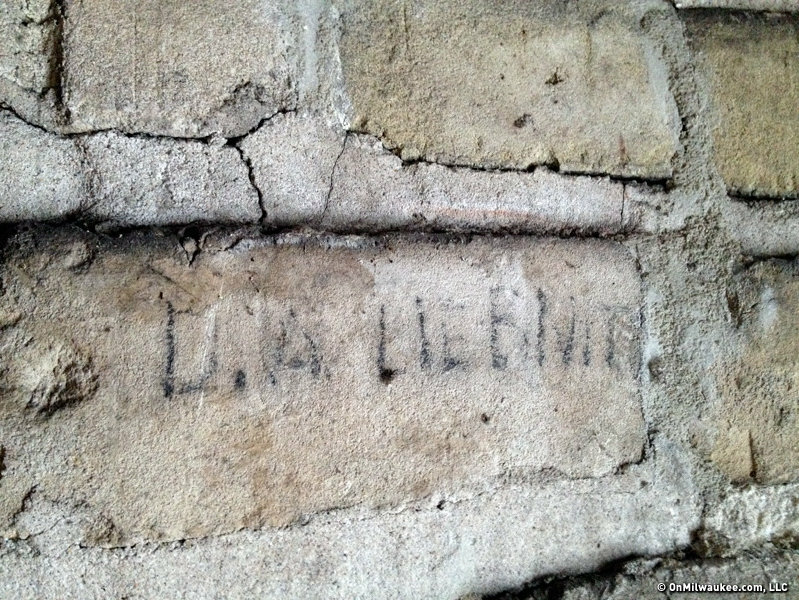 Since then, I've seen 19th-century graffiti, famous names, recent penmanship and more. Here is a sampling (in alphabetical order) of some of what I've found on my Urban Spelunking travels, with links to more in-depth stories on each place. 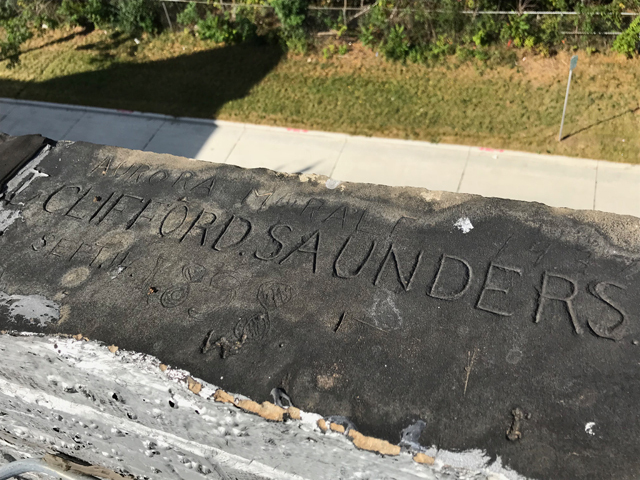 Carved into the top of the parapet on the roof of this Walker's Point building, this is pretty stunning. Clifford lived in the building at the time, and his dad William, was a photographer, it seems. Often you find graffiti like this stuff up in the B.C. rafters, which was left by the folks who built the place. This isn't terribly old, but it's in City Hall tower, which is about as prominent a building as there is in Milwaukee. I wonder if Jay T. actually did move on. 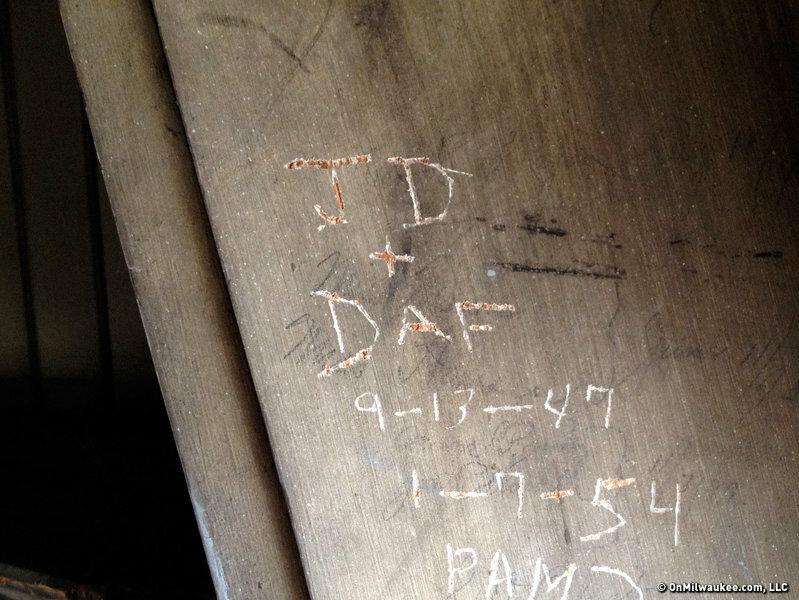 Covered in paint, the women's room door is also covered in graffiti etched over the course of many years. 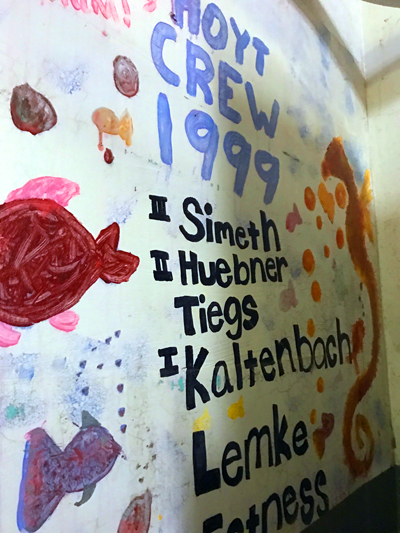 Each year, the young staff at Hoyt Park Pool has created a mural in the basement of the pavilion. 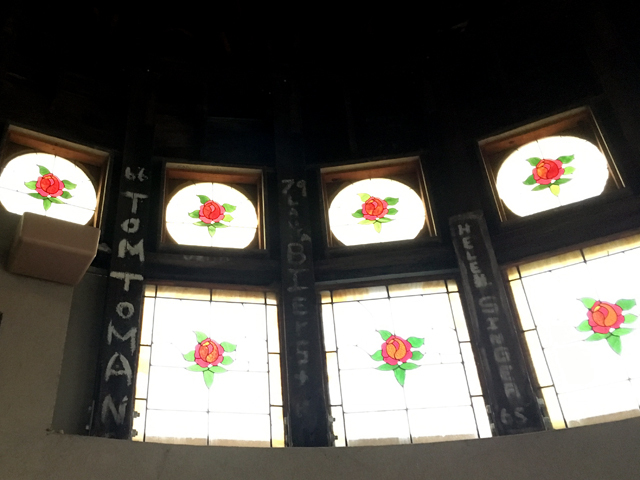 Maryland Avenue is an explosion of attic graffiti, including some in pencil from 1893, the year this part of the building was constructed. 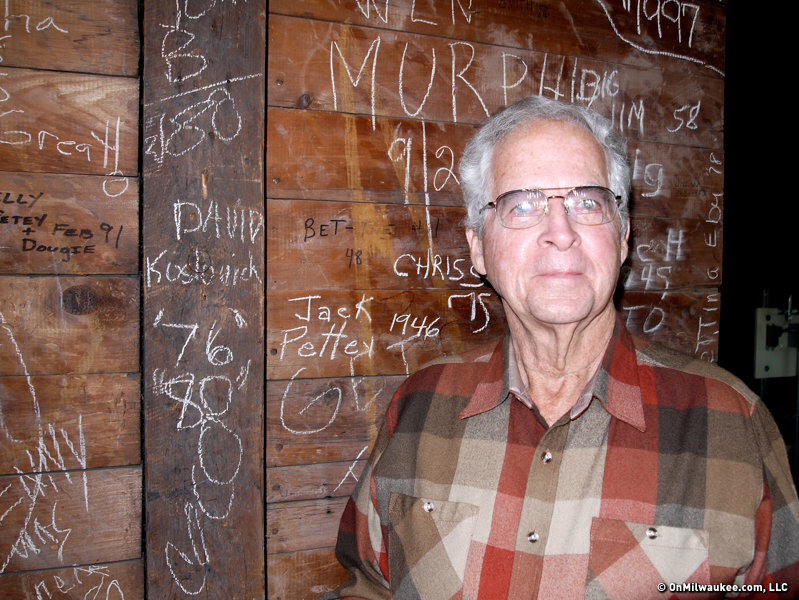 A few years ago, Jack Pettey (in the photo) came back to see the signature he added in chalk in 1946. How cool is that? 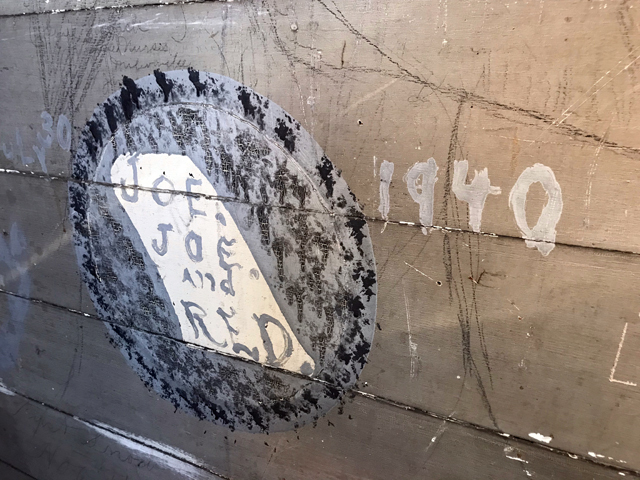 Like the dressing rooms beneath the stage at the Oriental, the Modjeska dressing rooms are tagged with names from performances that have been staged on the boards above. 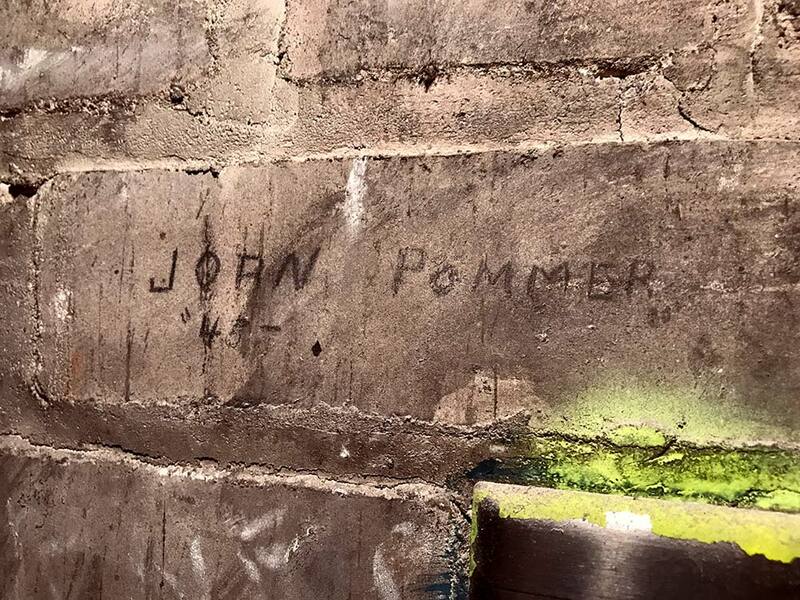 There isn't a ton of graffiti up in the tower of Old Main, which stands tall on the grounds of the Old Soldiers Home, but this one was definitely photo-worthy. I especialy like the period at the end. 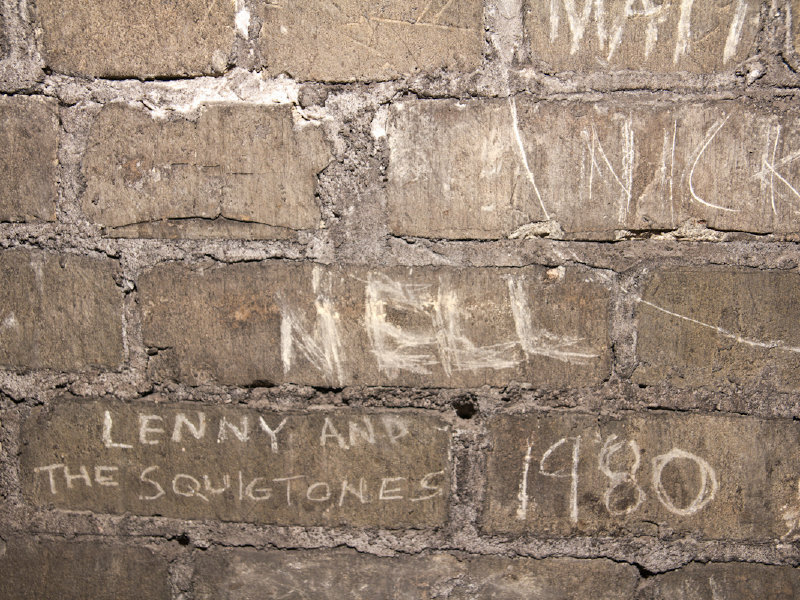 Band graffiti is always fun and this one – Lenny and the Squigtones was Lenny and Squiggy's band on "Laverne & Shirley." They actually released a record and toured, playing here in, well, 1980. 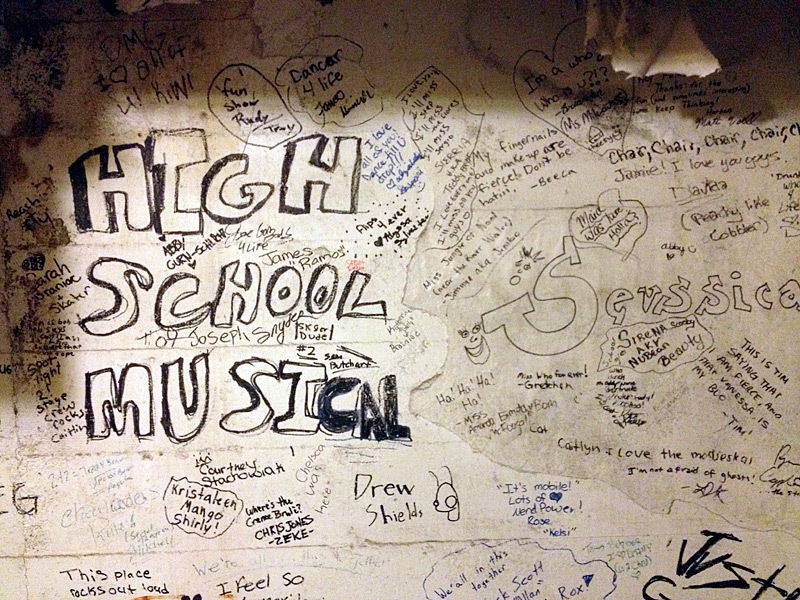 When I found some graffiti from a German prog rock band backstage at the old Palms/State Theater, I emailed the photo to the band's website and they responded to say they remembered the gig! Up above the stage in the auditorium of the Milwaukee Rescue Mission (which was previously Wells Street Junior High, Girls Tech and the Normal School), there is graffiti of all kinds: in chalk, in paint, in marker. This one is from during World War II. 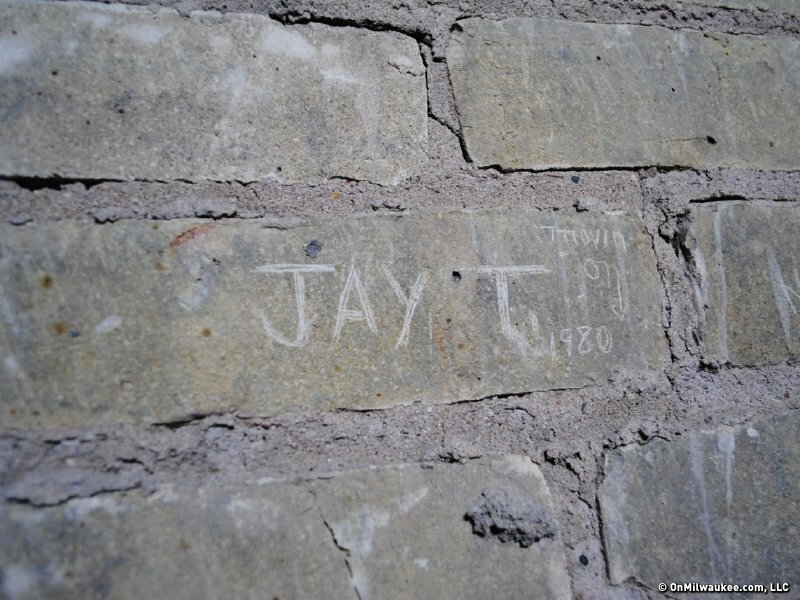 This graffito in the bell tower at St. Paul's is undated but you can tell the style of writing is quite old. That, along with its fadedness suggests it's quite old. Much of the South Side went into mourning when its beloved South Division High School was demolished in the 1970s. But, fortunately, the dome was saved and survives now at Bluemel's Garden Center at 4930 W. Loomis Rd. Stop over and you can see the graffiti that was penned with the dome was still in place on Lapham Boulevard but remains even today. OK, so this is not someone writing their name, or even penning something in the hopes of a shot at immortality, but I love it for another reason. 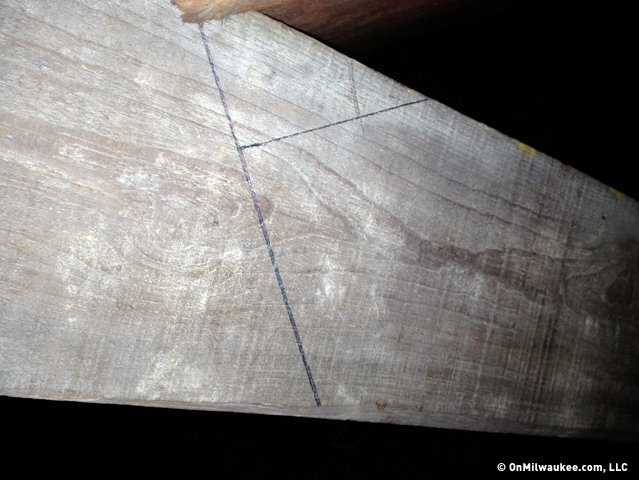 This is a carpenter's mark, likely an attempt to work out the angle of a birdsmouth joint. The fact that it's still in the attic at the now-closed 37th Street School, built in 1903, is pretty great, if you ask me. 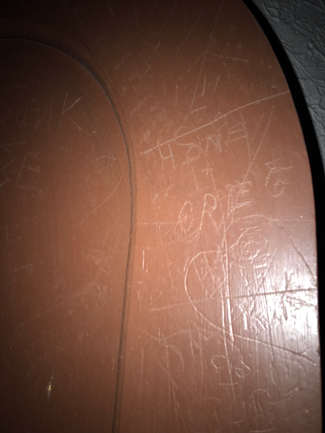 Up in the balcony of the ballroom, opposite the stage, there is a ton of graffiti carved into the ledge where you likely set your beer during gigs. But it's dark then so maybe you haven't noticed. And maybe you haven't noticed the name of Stoney McGlynn, who pitched for the American Association Milwaukee Brewers from 1901 to 1911. 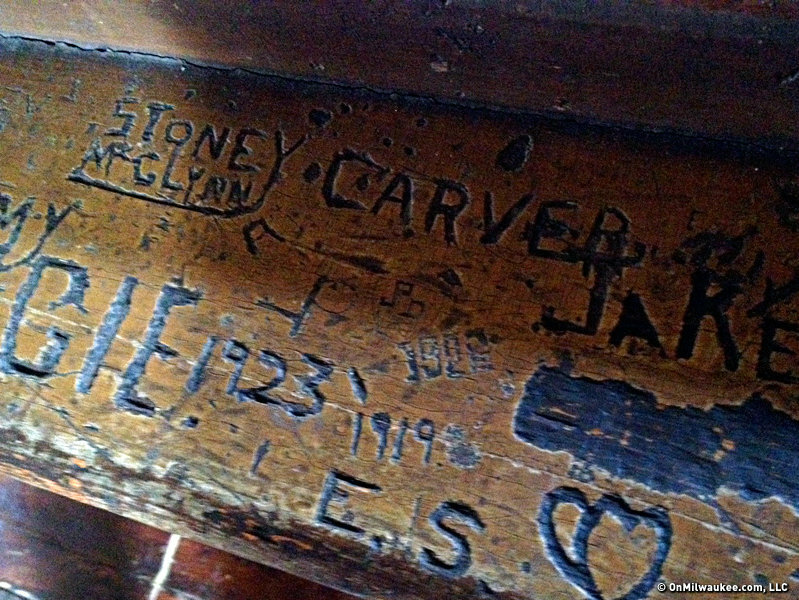 Up in the tower at Alexander Mitchell's old place, designed by Edward Townsend Mix – now The Wisconsin Club – there's graffiti. 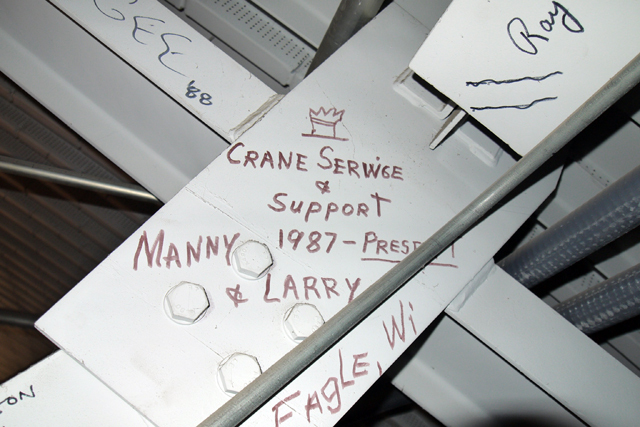 Here's some scrawled into a beam.